We've got the inside scoop on the very best restaurants in Falmouth restaurants. Guests are often looking for the very best of the best restaurants in Falmouth, so we’ve put together our favorites for you. To view restaurant menus and images, please visit their websites by following the links below. The Glass Onion: One of our favorite fine dining dinner spots. A husband and wife team, Josh and Tally, run the restaurant, and it shows in the loving care they put into the food and atmosphere. 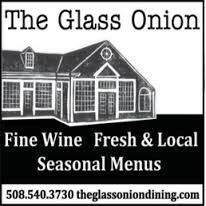 The Glass Onion is located within easy walking distance from the inn, and accepts reservations for parties of 6 or more. Cape Cod casual attire is recommended – button shirts (including Polos) and khakis or slacks for the gentlemen, and the same, or dresses for women. CSalt Wine Bar & Grille: Another husband and wife team, Jonathan and Jill own CSalt. It’s our other very favorite restaurant to recommend. It’s is a three minute drive up through Famouth Village, Cape Cod casual attire recommended, reservations accepted. LaCucina Sul Mare: a next top favorite dinner spots that also offers lunch. 3-4 minute walk from the Inn heading East down Falmouth Village’s quaint Main Street. Here you’ll experience another husband and wife team that have perfected delicious authentic Italian food. In addition to some of the best Italian Pasta meals around you can enjoy fresh fish dishes and their spectacular famous warm salad. 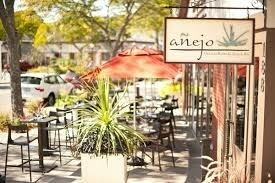 Anejo Mexican Bistro: a short 3 to 4 minutes walk from the Inn heading East down Falmouth Village’s quaint Main Street. Anejo is a popular Mexican Bistro known for great food and their ala carte Margarita menu. If you are lucky enough to be around on May 5th, Cinco de Mayo, Anejo hosts an outside celebration complete with music, $5 burritos and special drink deals. During the nice weather months Anejo has high top outdoor dining and the front of the restaurant which faces Main Street and the outdoor dining area has full glass sliding doors that they open for all to enjoy the warmer weather. 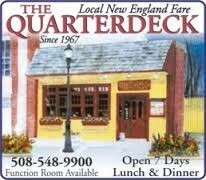 Quarterdeck Restaurant: open for lunch and dinner, and a favorite of the locals. Mostly known for their vast seafood offerings and clam chowder, the Quarterdeck has a vast menu that also includes numerous appetizers, salads, and great hamburgers as well as steaks. At the Quarterdeck you will experience the feeling of being below deck in a sailing vessel. A good deal of the interior was salvaged from MacDougall’s Boatyard in Falmouth Harbor with some of the wood dating back to the late 1600s. A local artist, Joe Downs, is responsible for the design of the interior and created the stained glass in the dining room. This stained glass was once the front windows from a church in Maine that was destroyed by a fire or hurricane. 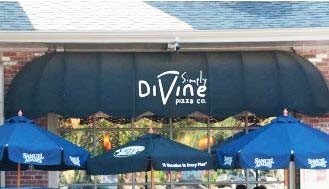 Simply Divine: has outstanding Pizza as well as panninnis, Italian dishes such as lasagna, home made soups and generous and tasty salads. You can watch the chefs hand throw the pizza crusts as they have an open kitchen. The pizza range from your traditional Margherita Pizza to such interesting blends as sweet potato and bacon as well as a very popular fig and proscuitto pizza. 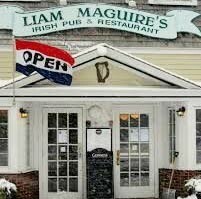 Liam Maguire’s Irish Pub: Another fun restaurant just a short walk from the Inn which is well known for the musical entertainment that they sponsor including co-owner Liam himself. Some of the favorite groups at the Pub include Stage Door Canteen (big band amazing music) and the Shenanigans (music and fun to be had). The Pub also is home to a popular trivia night and other special events such as paint night. 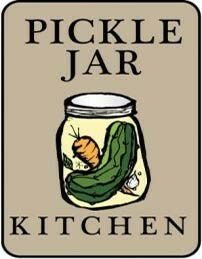 The Pickle Jar Kitchen: located at the east end of Falmouth Village Main Street and a few short minutes walk for the Inn. This is a family run restaurant with 2 couples who have been best friends since college. They serve breakfast and lunch (but since we’ll fill you up on breakfast at the Inn, we recommend The Pickle Jar for lunch). Check out a quick read on Fan Favorite dishes at Pickle Jar and some interesting trivia click here. 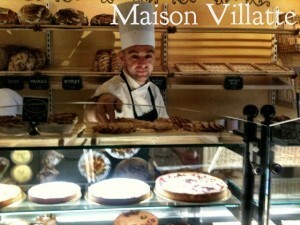 Maison Villatte: Another lunch recommendation, an authentic French bakery, well known for all their delectable treats. At Maison Villatte you will also see a spry lunch business with items such as their baked monte cristo sandwich. 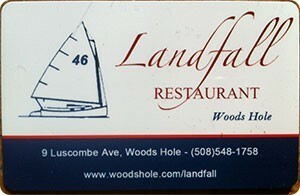 Landfall Restaurant: another area restaurant that is family run. It was started in 1946 by a man who grew up around Falmouth in the summertime and his sons now own and run it. Similar to The Quarterdeck, a lot of interesting wood and material was recycled and used in the building of the Landfall. Much of the wood came from shipwrecks and old buildings. The Landfall has a beautiful stained glass artifact which is a window showing the wharf and a waterfront scene. The window came from a prominent mansion of Penzance Point. 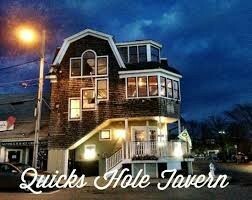 Quicks Hole Tavern: The newest restaurant jewel in Woods Hole, built on the success of the seasonal restaurant Quick Hole Tacqueria, comes this year-round high quality “farm to table” lunch and dinner hot spot. Located just across the street from the Martha’s Vineyard Steamship Authority terminal, this restaurant offers great food, drinks and views of the ferry’s comings and goings. In the short time since the restaurant opened in 2014 it has become a guest favorite and the press received from Cape Cod foodies and beyond has been remarkable. For Fan Favorite dishes click here. By this time you should have realized that restaurants in Falmouth are a great place for all foodies. This only provided the top spots based on guest feedback however, there are numerous other restaurants in Falmouth Village, Woods Hole, North Falmouth and East Falmouth that are there for your exploration.